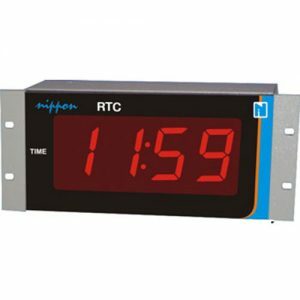 Master Slave Clock – Nippon Instruments (India) Pvt. Ltd. The Master/Slave clocks finds application in processes where time synchronization is required. The MASTER clock can be connected to computer on RS232 port which is a serial data transmission. The SLAVE clocks are connected to the master on RS485 port which is a parallel data transmission. The range available is HOURS: MINUTES: SECONDS or HOURS: MINUTES. The clocks are available in 99 HRS: 99 MINUTES: 99 SECONDS. The state of art microcontroller assures time accuracy of 0.01 %. The clocks in the network displays the same time simultaneously. The maximum slave clocks possible on the network are 32. The Time and calendar configuration can be easily adjusted as per the user requirements. The user friendly GUI works on Windows XP/2000 platform. Master – Slave time selection is optional either manual or by PC. Display height available is 2 “ or 4 “ with red color and time tick LED indication. The instrument has EMI / RFI filters for harsh electrical environment sustainable capability. The instrument is designed with two/four relay outputs for process control or ALARMS. The power supply given to the device is 230 V / 50 Hz AC. The instrument is housed in MS powder coated enclosure having size 425W * 175H * 100D.